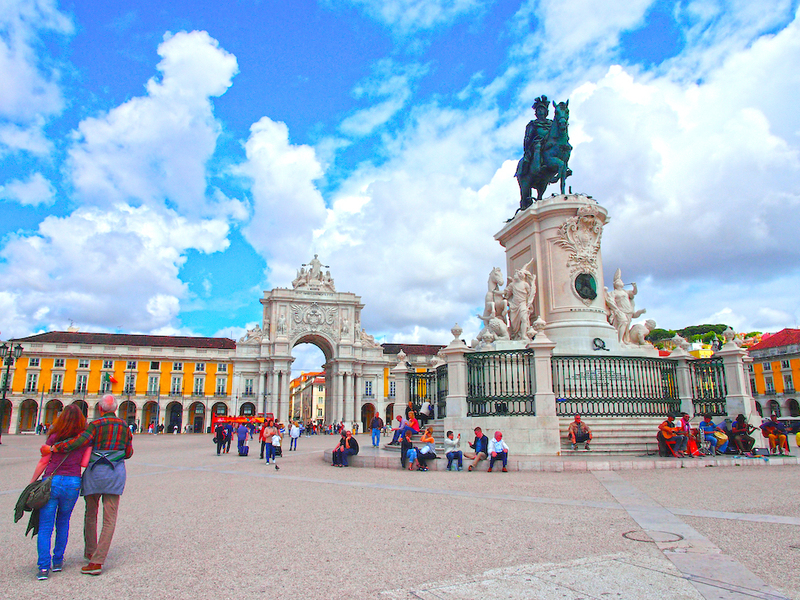 Conquests by Phoenicians, Romans, Moors and Christians have left Lisbon with a fusion of cuisine and culture, a treasure chest of activities and restaurants. Here are my favorite ‘must-do’s’ gleaned from a recent visit. 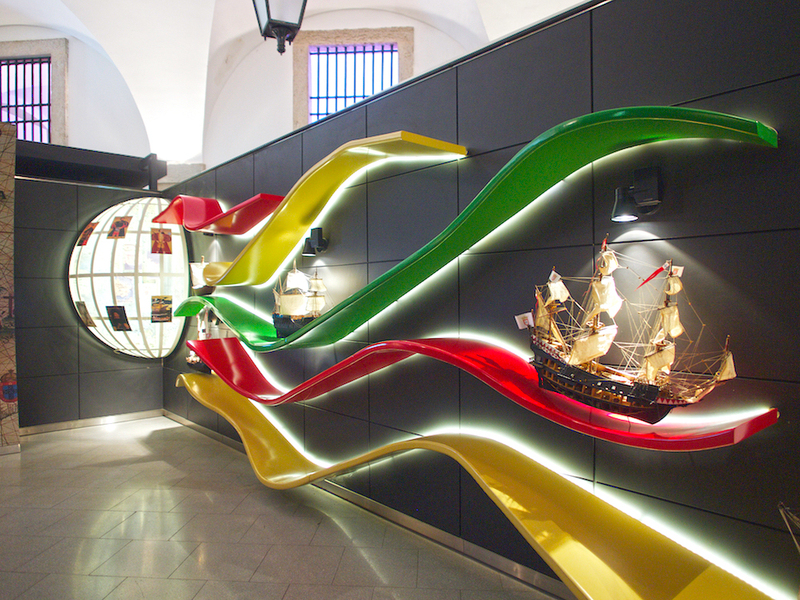 No better place for insights into the city’s evolution than the innovative Lisboa Story Centre on Terreiro do Paco Square, featuring elaborate, computer-operated sets with a light-hearted audio guide. So innovative is it that upon entering a simulated 16th century warehouse filled with barrels, we smelled coffee, cardamom and saffron, all products transported on Caravela ships centuries ago. Here, you’ll learn why Lisbon became the capital in 1253 and the crow selected as its symbol; how it became the center of world exploration producing adventurers such as Vasco de Gama and Columbus; and how a devastating earthquake in 1755 changed the city forever. For a post-museum treat, we walked to the Mini Bar restaurant where ‘nothing is as it seems.’ Having trained at El Bulli, chef Jose Avillez opened this, his first venture, inside the Sao Carlos National Theater where a lively, casual atmosphere prevails. Intriguing cocktails include caipirinha presented as bon bons and Ferrero Rocher chocolate tasting of foie gras and hazelnut. Adopting a theatrical theme, the minimalist menu features six ‘acts’ – tapas ranging from tempura of avocado and veal croquettes to tiny slices of mackerel smoked tableside under a glass jar. With Lisbon’s downtown being compact, transport is best by tram. We took a ride on the number 12 which travels up steep streets granting not only panoramic views over the Tagus River and the red rooftops of Alfama, the city’s oldest district, but also delivering us close to the most famous castle, the 18-tower Saint George. Dating from the 6th century and formerly occupied by Romans and Visigoths, it then served as a Moorish royal residence until Portugal’s first king Afonso Henriques aided by Crusaders captured it in 1147. It is home to the city’s oldest map and a beautiful 15th century mosaic while the Tower of Ulysses contains the Câmara Escura, a periscope that projects sights from around Lisbon. Wander around the archaeological digs where Phoenician and Moorish artefacts were unearthed, the oldest from the 7th century BC. 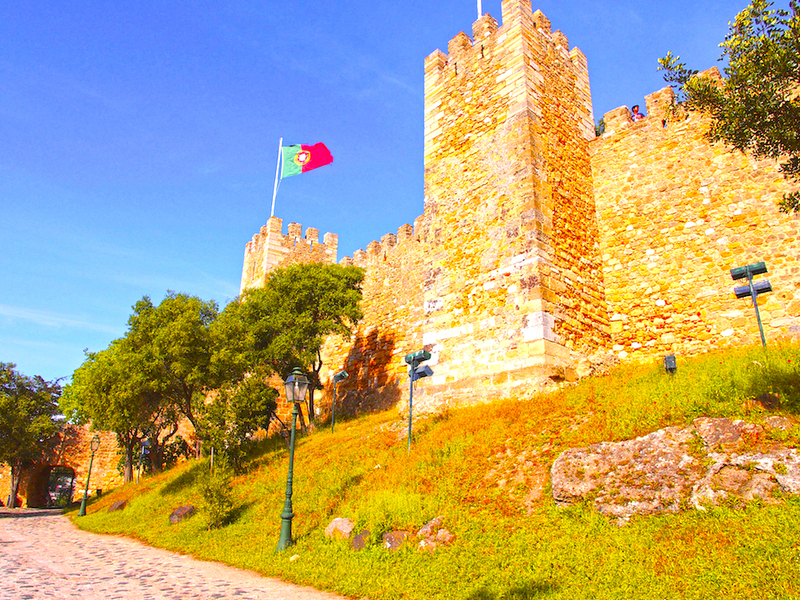 A special Lisboa Card offers free entry to the castle as well as other museums. Visiting a seat of royalty deserves a royal reward and the 2 Michelin-star Belcanto restaurant provides. Located opposite Sao Carlos Square, which features a statue of a man wearing an iron mask, symbolizing the writings of Fernando Pessoa who was born nearby, it offers inventive haute cuisine. The atmosphere is classically elegant with wood-paneled walls, crisp white linens and impressive gilt-framed mirrors. 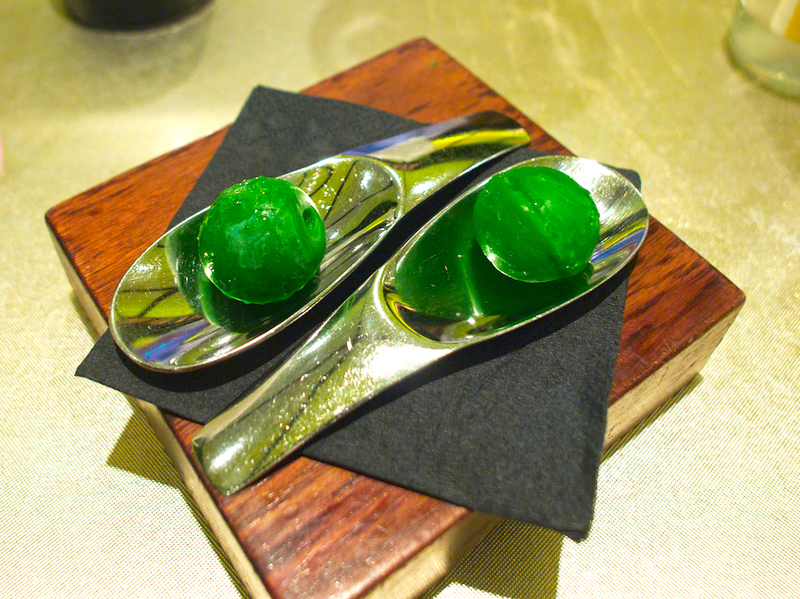 Here traditional Portuguese ingredients are transformed into eclectic forms: lupin bean, tofu, kaffir lime and piri piri on a silver spoon, beside an olive – minimalist presentation drawing one’s attention to the pure tastes of bean and olive. 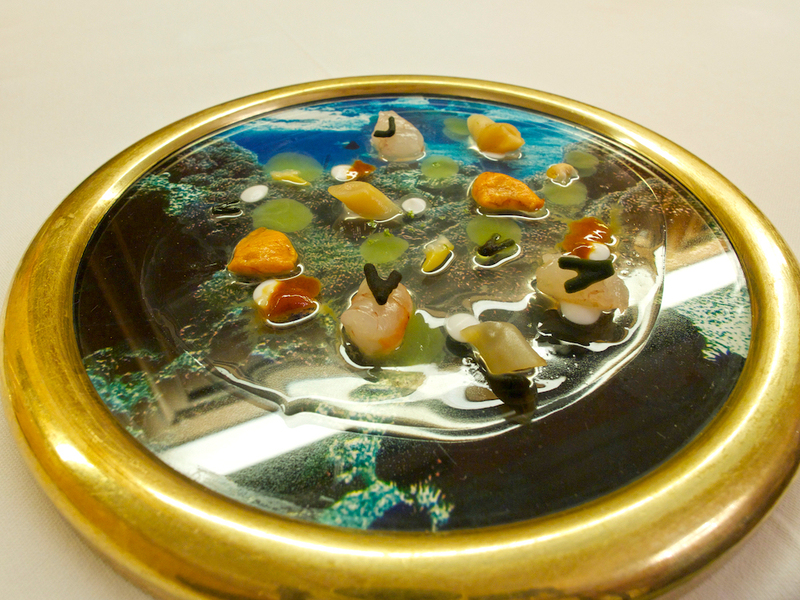 Or ‘porthole,’ morsels of seafood and seaweed so well designed on our plate we were left with the sensation of gazing to the ocean floor through a window. 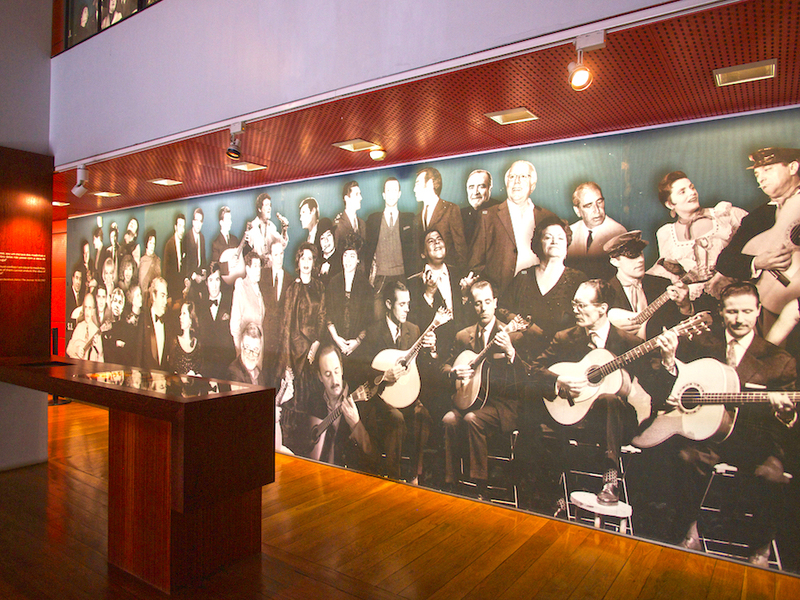 Fado – 19th century music characterized by mournful melodies and lyrics – is inextricably linked to Portuguese culture and the Fado Museum offers comprehensive insights into this passionate genre. Though originally associated with leisure parties (cegadas), then with theatrical performances, fado has taken on modern dimensions, an evolution the museum illustrates through photographs, video material and musical recordings. 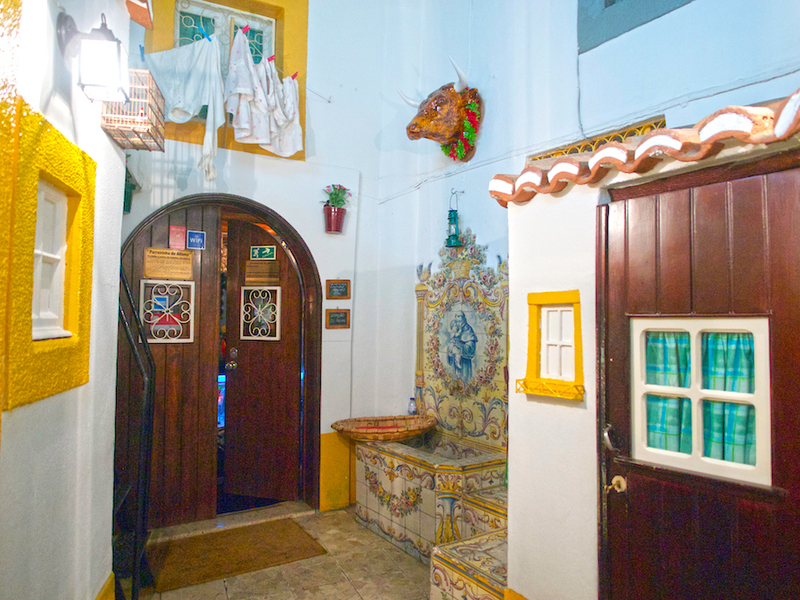 Having spent over an hour there we realized a live performance was a perfect follow-up and chose Parreirinha de Alfama Fado (Little Vine of Alfama) restaurant, on a tiny alleyway on Beco Espirito Santo Street near the museum. Founded by Argentina Santos, a popular singer in the 50s, it is run by Paulo Valentin and Bruno Costa, both skilled guitarists. 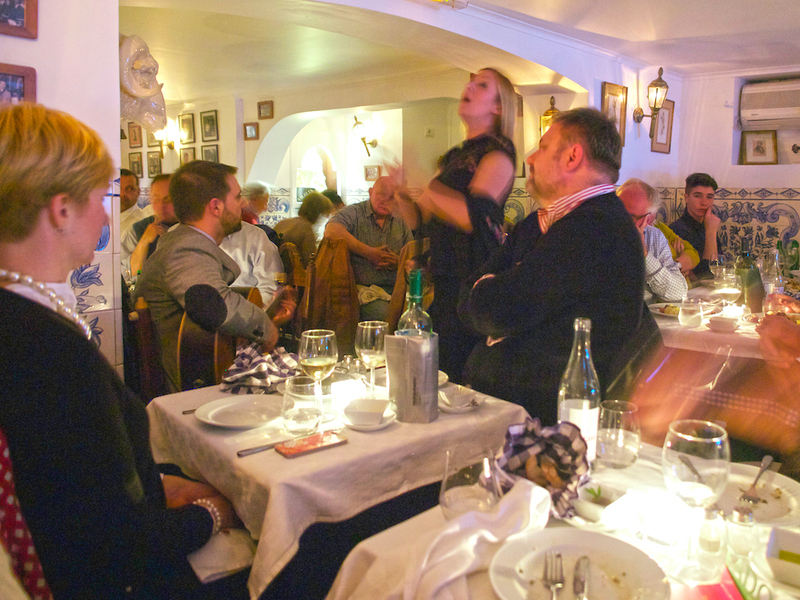 Decoratively tiled walls, framed photos of fado greats, guitars hanging on the entrance walls and a bar-counter lined with ceramic carafes and miners’ lamps emanated a sense of inner city authenticity. While not a fine dining establishment, the food is of high quality, traditional Portuguese and the grilled prawns with azorian sauce is an excellent choice. Try a bottle of Casa de Canhotas from Alvarinho in the Vinho Verde region. The intimate setting and hazy lighting created a cozy atmosphere in which five performers sang with rich, expressive voices in both solo and group performances. Having explored Lisbon, rent a car with Auto Europe for a short, 30-minute drive along a scenic coastal road to Cascais and Sintra. The former was once a quaint fishing village – it still boasts a lively fish market and brightly colored boats – before becoming a popular resort for nobility. Now it is a cosmopolitan town with pretty pedestrian streets, luxuriant villas, fashionable shops and restaurants. 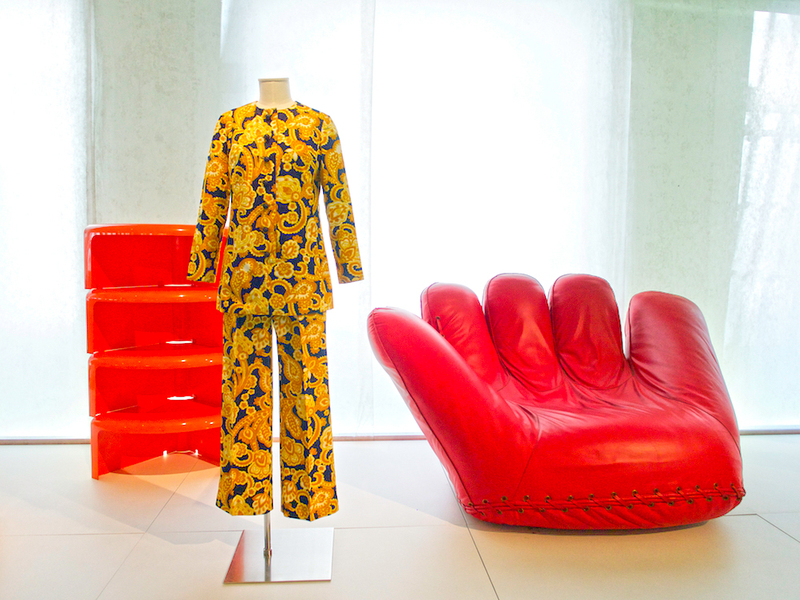 A visit to the Castro Guimarães Museum grants glimpses into the lives of 18th and 19th century aristocracy. 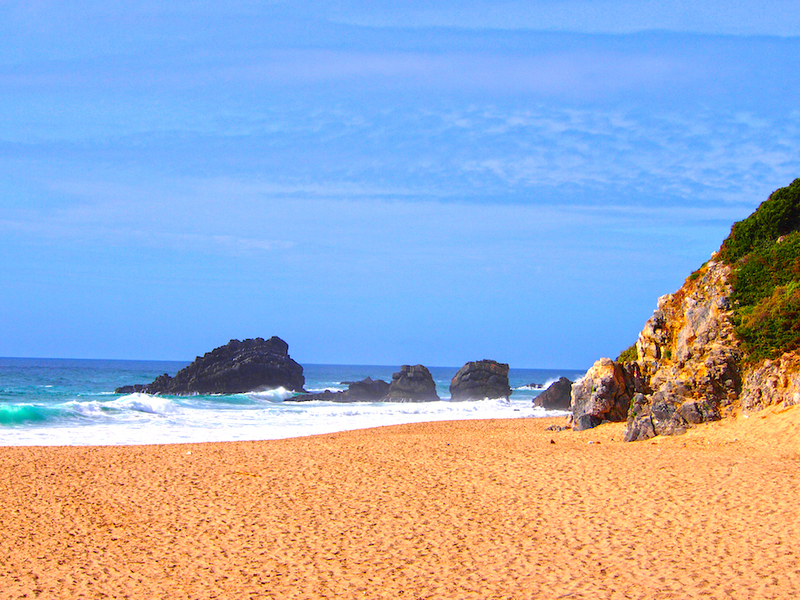 The nearest beach is Guincho, a surfing mecca backed by high dunes. Dining locally, we chose Hemingway, owned by Pedro Vaz Moura, standing right on the marina with a wood-floored semi-enclosed terrace bordered by potted flowers and a low-ceilinged interior with crisp white linens and ornate table settings. An experienced mixologist, Vaz Moura offers an impressive 9-page drinks menu that includes 29 gin and vodka cocktails and 14 mojitos. His chef, Bruno Soares Povoas, matches his imaginative drinks skills with food, including a dark chocolate-covered foie gras ‘lollipop,’ a Thai diptych of seafood ceviche with scallops tartare and crispy prawn on a bed of corn and coconut; and tender Portuguese veal with mushrooms. As for dessert, it was simply too hard to resist Bruno’s ‘boat of discovery,’ a sinful concoction of chocolate, coffee, cinnamon and almond. Nestled amid rolling hills, Sintra, a 20-minute drive from Cascais, is a beguiling town of narrow streets filled with palaces, castles, monasteries and monuments that have earned it several UNESCO World Heritage designations. Among them are Sintra National Palace, a mix of Gothic, Manueline and Moorish architecture; the Moorish Castle, notable for its unique setting, perched high on an outpost of the Sintra-Cascais Natural Park; and the Queluz National Palace, one of Europe’s last major examples of Rococo architecture. The Museum of Modern Art, a collection of 20th century European and American works, is housed in a restored 1920s building. 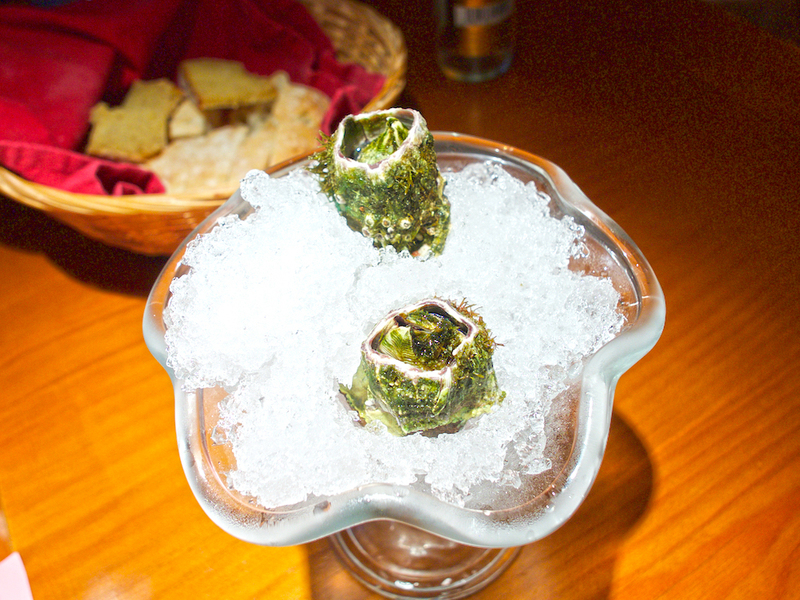 For convenient dining, we tried Romaria de Baco. Opened four years ago, this restaurant close to the tourist office, is the tale of two Pedros – the owner, Pedro Miranda an electric engineer and his head chef, Pedro Castro. Using his construction skills, the former renovated the one-room space, creating an intimate ambiance with low lighting, terracotta floor, wooden tables, pinewood ceiling and a semi-open kitchen. 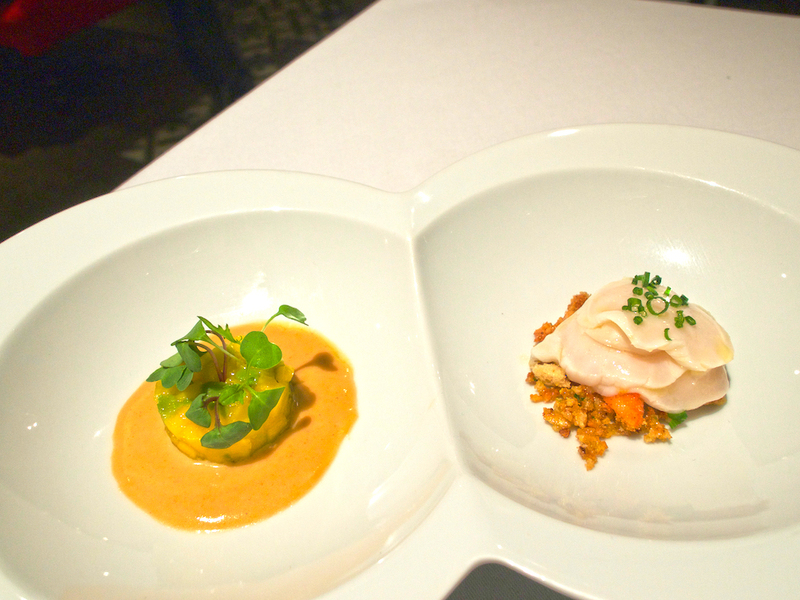 The latter creates dishes with a distinct Azores influence, the place he was born. We sampled several tapas of tempura prawns and cuttlefish and homemade pies oozing game sausage and stewed octopus. Among the wine list is the celebrated Colares variety, where vines grow next to the beach. 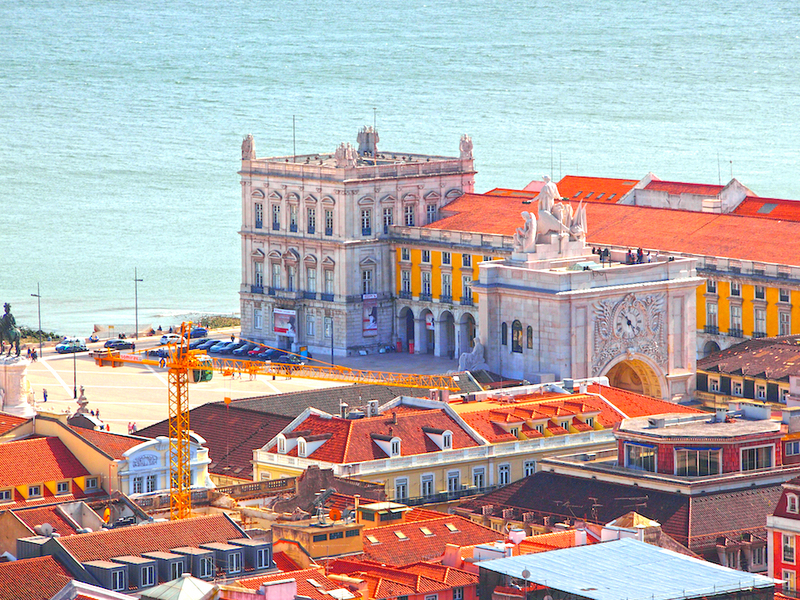 From archaeology to fashion and Fado, from innovative cuisine to castles and coastlines, that’s ample enough to qualify Lisbon and its environs as a most attractive vacation destination. Posted in DestinationsTagged Cascais restaurants, coastal drive in Portugal, gourmet restaurants Portugal, luxury vacation in Lisbon, Portugal fine dining restaurants, Sintra fine dining restaurants, visit Lisbon in style, what to do in Lisbon, where to eat in PortugalBookmark the permalink.